"Austin Seminary Association Awards are presented annually to persons who have distinguished themselves through service to the church." 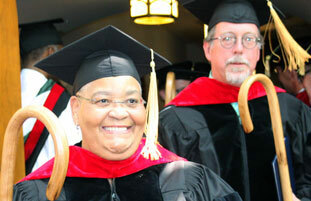 The Award was established by the Board of Trustees and the ASA Board in 1975 and has been presented annually since then to recipients chosen by the Austin Seminary Association Board. The Office of Seminary Relations solicits nominees each spring/semester, and awardees are selected at the fall meeting of the Austin Seminary Association Board. Each recipient receives an appropriate tribute and plaque, presented at the annual meeting of the Austin Seminary Association, in conjunction with the ASA Banquet at the conclusion of MidWinter Lectures. At the fall meeting of the ASA Board, an Awards Committee will select nominees from those nominated, usually two, but no more than three per year, and then present the nominees to the ASA Board for approval. In any given year, the Awards Committee may determine that no award will be presented. Nominations will be kept on file for 3 years.